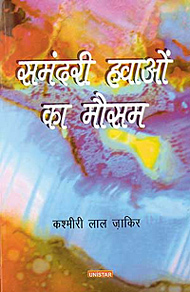 by Kasmiri Lal Zakir. Unistar Books, Chandigarh. Literature, especially fiction, can be seen as history written from the heart rather than the head. These short stories by Kashmiri Lal Zakir have been woven around the twists and turns of India-Pakistan relations. True to his stature, Zakir’s canvas has panoramic dimensions and his strokes have an informality that comes naturally to masters. In the first story, from which the collection draws its name, Smundari Hawaon ka Mausam, he starts from the hill terrain of Anantnag (in Kashmir valley, where Zakir spent many years of his early youth) and ends up on beaches of the port city of Karachi. It is a charming tale of Hindu-Muslim brotherhood transcending national boundaries. It tells the story of families that have been separated for decades but meet for a brief reunion during a one-day cricket match in Karachi. The second story Sada-e-sarhad moves between Jhang in Pakistan and Qadian in India, recounting travails of a betrothed couple whose marriage plans are disrupted by terror attacks on the Indian Parliament revive with the restoration of people-to-people contact at the initiative of the Indian government. Their trauma makes for a gripping read. Guddi, the story of Hakal, a village yokel from Uklana in Jind district of Haryana, is about a marriage without love, wherein the protagonist lands up in a jail in Multan, Pakistan, and encounters a kind-hearted jailor whose daughter Guddi shares the name of his own daughter. When the two countries exchange prisoners as a part of the process of normalising relations between them, he faces the dilemma of going back to those whom he had deserted. Amir Chand Makkar, the protagonist in Platform Par Baitha Akela Admi, is among the last few to reluctantly leave his first love and his native village —Raman in Dera Gazikhan — at the time of Partition. He can never forget the tender Rahmatan. She continues to live in his memory even after his marriage to Mukando and the birth of their two sons and two daughters. Their marriage has everything but love. Zakir weaves a colourful tapestry around the wave of good will between India and Pakistan that started with the arrival in India of two-and-half-year-old Noor Fatima for treatment of a heart problem. The touching real-life story that unfolds at the Bangalore hospital is heart warming. In Noor he Noor hai Nigahon main, the last story in the collection, we find two Pakistani toddlers, Afzal and Rohit, with complicated heart problems who come to the PGI in Chandigarh for treatment. Iqbal, from a remote village in Pakistan, is being treated at Escorts in Delhi while the Sialkot "blue baby" Junaid comes to Bangalore’s Shanker Hrudyalaya just when Noor Fatima is on her way back to Pakistan. Zakir’s stories flow like a river — spontaneous and lively. However, jarring spelling mistakes sometimes spoil the flow of the narrative. In the age of computerised type-setting and smart spell-checks this could have happened only if the publisher decided to take a short-cut and dispense with the services of the good old proof reader.